Many people may think that document shredding services are no longer essential especially at this point in time when paper shredders can already be accessed easily. 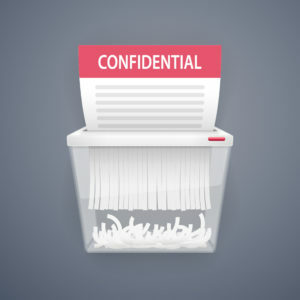 However, the need for document shredding service is undeniably essential because of the invaluable role that it plays. It is an effective solution to handle increasing quantity of outdated files especially for a business that is in expansion. Secure document disposal leaves no trace of the records destroyed making sure that even the minutest detail of client or business will no longer be available. Get more space for other equipment in your workplace or for employees to move around freely instead of acquiring shredding machines that only get in the way. Allow employees to focus on more productive tasks and contribute on business growth than deal with document handling tasks. This will also eliminate the risk for confidential information to leak among your employees. Take advantage of the guarantee provided by professionals who offer document shredding services. Failure to destroy documents completely will be the legal responsibility of those who are supposed to take charge of confidential document handling. There may be other options to effectively deal with document handling requirements but for sure, document shredding service offered by professionals is the most suitable choice that will allow you to take advantage of the benefits that matter most for your business.